Play a game of tabletop billiards with coins, to demonstrate, friction, energy transfer and action-reaction. 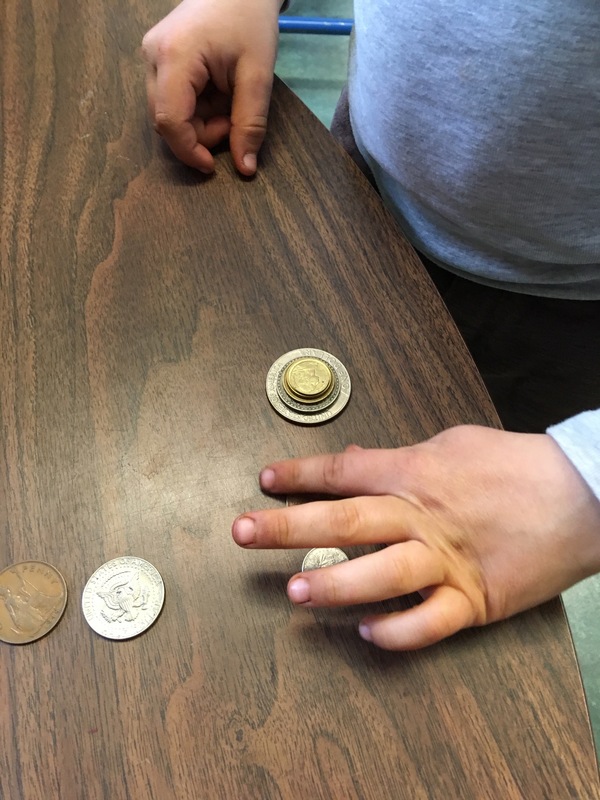 Students pairs flick a coin across the table top to each other. Ask them to notice how the coin slows down, and that they have to change the strength of the flick to get it all the way across. Try flicking across different surfaces (carpet, smooth floor, sand paper) and compare which slows down the coin most and which slows it down least i.e. which has most friction and which has least friction. Discussion: what surface made the coin go slower. What did it feel like? The rough surfaces rub the coin more - there is more friction, and slow the coin down more. Students have three coins each. 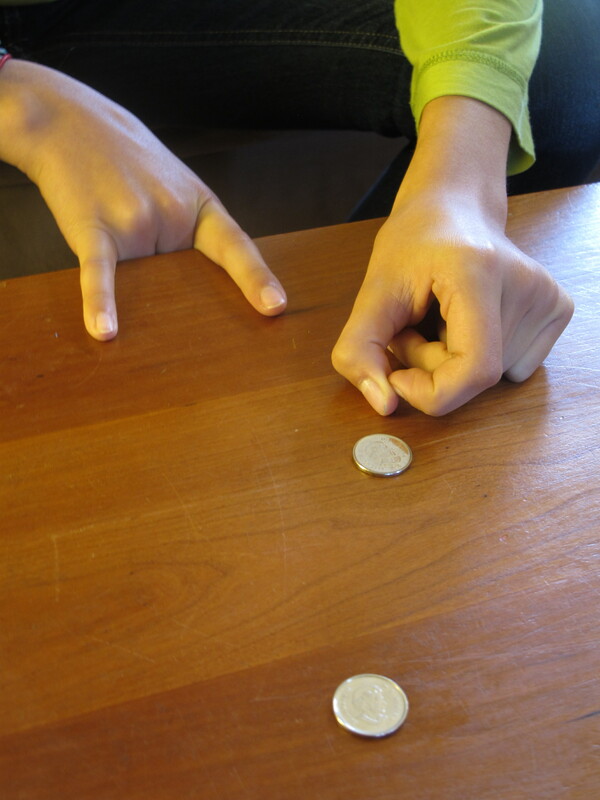 Demonstrate how to use a finger to flick a coin across the table, then how to bump one coin into another. 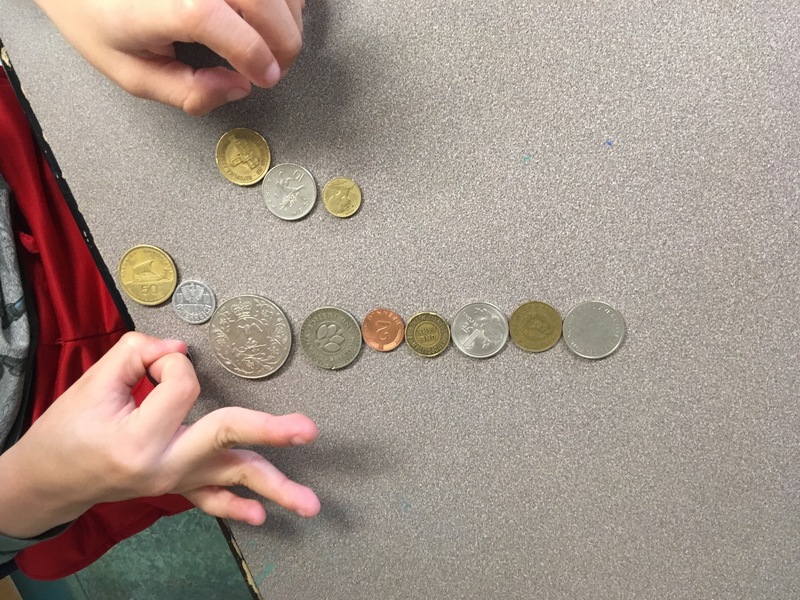 Challenge students to see how many coins they can bump into each other. Optional: make into a challenge or game. Students can make a goal with the index and little finger of one hand, over the edge of the table. 1. 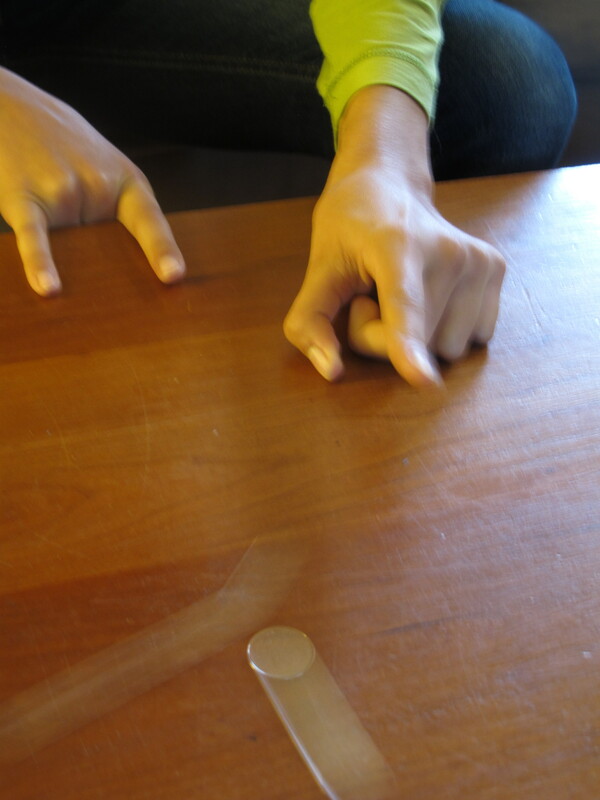 Slide the side of your finger quickly towards the coin/flick the coin with your nail to propell it forwards. 2. Every play must include at least 2 coins i.e. a coin must hit another, or there must at least be an attempt to hit another. 3. Goals only count when a coin was hit into the goal by another coin. 4. Coin is out of play when it it flicked off the table. 5. Final score when both players have run out of coins. 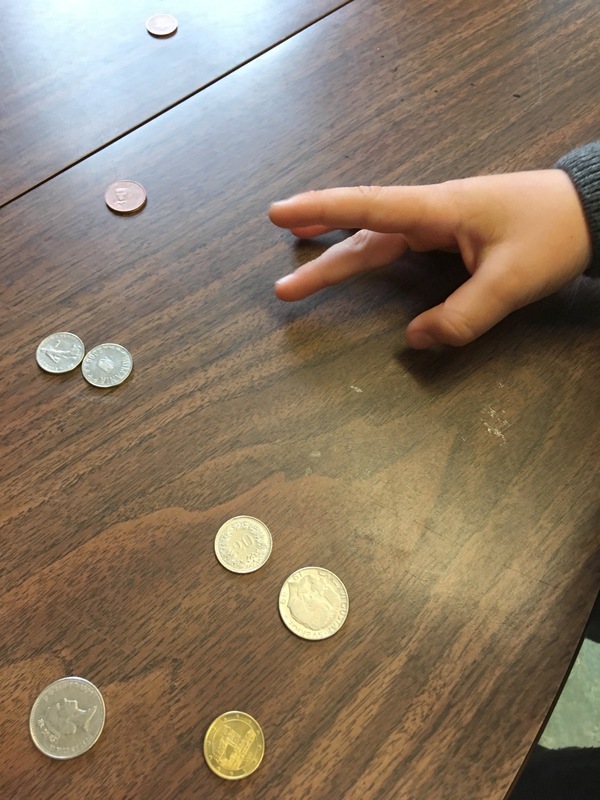 While the students play the game, ask them to think about the forces involved to move the coins. They can also think what happens with the forces as one coin hits another, and why the coins stop sliding. Once all games are over, gather as a group for students to talk about the forces and transfer of energy that the students noticed. Demonstrate to the group as each move is discussed, to make clear the forces that are being discussed. The force of the finger hitting the coin makes it move. The force of one coin hitting another makes the second coin move. As one coin hits another, energy is transferred from the first coin to the second coin, so that the first coin can move and the second coin stops moving. Coins stop moving along the table, even if they do not hit another coin, as some energy is lost as heat from friction between the coin and the tabletop, and some is dissipated as sounds waves. First Law: Any object will stay still, or continue to move in a straight line, unless an external force acts on it (e.g. finger hitting coin, coin hitting another coin). Second Law: Larger force or a larger object will alter the speed of motion of an object (flicking harder, or using different-sized coins will alter how far the coin moves). Third Law: An object will have an equal and opposite reaction to the force applied to it (the coin pushes back on the finger when it moves forward). Games that involve similar transfer of forces: curling, billiards, boules. 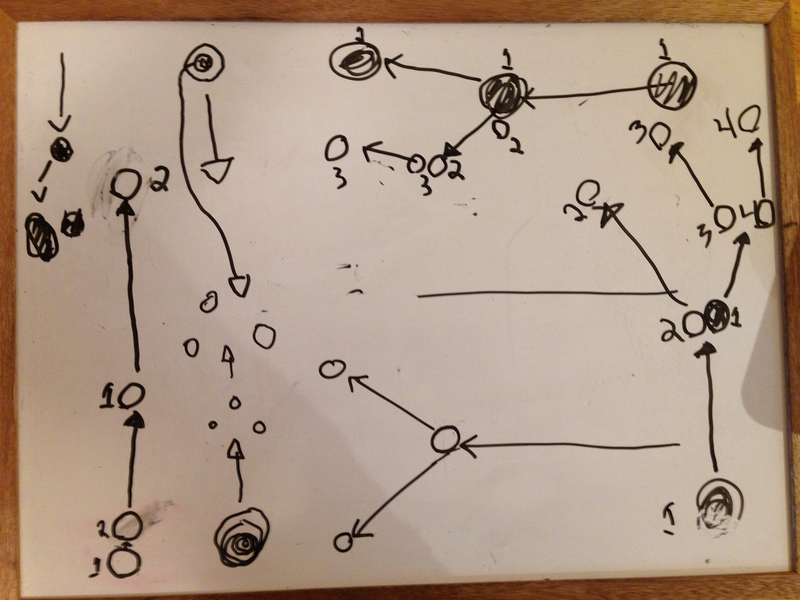 Try altering the slope of the table, so that one player is flicking up-hill - does this affect the movement of the coins? If so, can add the force of gravity to the discussions. Try altering the table surface, to change the amount of friction.